I am surrounded by water. 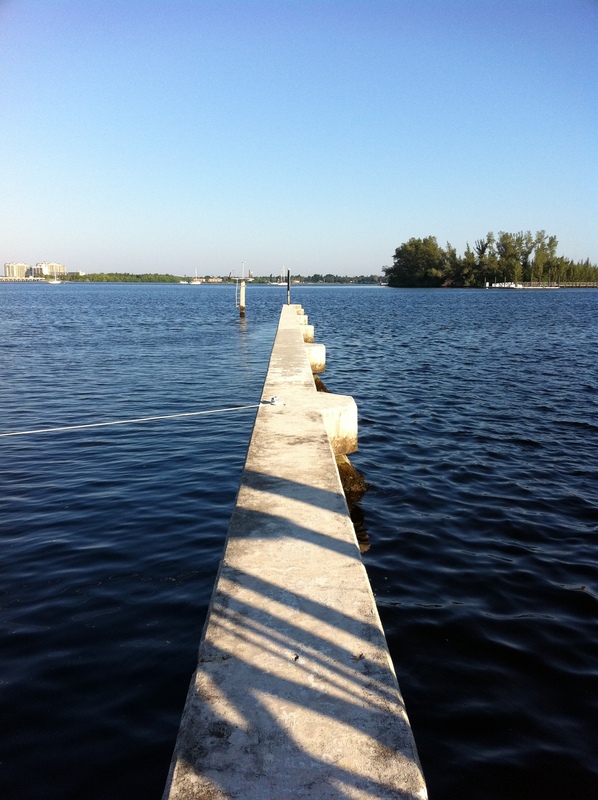 A sky of cobalt is above me, rays of morning sun stream through the space between downtown high rises, and all around this concrete jetty are the black lapping waves of the Caloosahatchee River. A cool breeze nudges the tinkling wind chimes on the deck of a nearby boat as a haphazard collection of birds welcomes the day with a song, and a shadow drifts across my page as the mast of a small powered sailboat passes through the path of the dawn, dragging its life boat and owners’ schedules behind it. The bridge in front of me makes a gentle arc across the river; a highway of asphalt beckoning cars to bring their owners across the water for a busy day ahead. Their engines provide the background noise, the audio canvas over which all other sounds must somehow stretch to take their turn in my ears. There is no salt smell here, just the ever-so-faint odor of brackish river water making its way to the sea. that in this moment, from this place of quiet reflection, I can hear God better. I want to say that in this spot of solitude I can pray deeper, more devotedly, more focused. Maybe it’s because for me, the distractions outside tend to be far less than the ones living in my head. Perhaps if I am successful at tuning out the waves and the cars, the wind and the wind chimes, then I can also silence the inner voices that pull my thoughts away from me like leaves drifting with the current. Then again, maybe I have it all wrong. Maybe this morning, prayer is not about tuning out, but tuning in. Is there a place to let language and lists and specific requests be put aside for a while, a place to just bask in the glory of our senses and the God who made them and fills them with good things? Yes, maybe today I need not worry about checking the list and checking off boxes. Maybe today I pray, not by only speaking to God, but by speaking and agreeing with the words He gave at the dawn of our time. You, O Lord, made the heavens and the earth and all that are in them, and even in the midst of a broken and sinful age, I look at your world and agree with you: It is very good.